Crystal is one of the most fascinating substances in nature. The crystalline structure lends itself uniquely to various adaptations, including information storage, and crystal technologies are at the cutting edge of advancements in nanotechnology and computing. Crystal skulls are one of the most intriguing enigmas in history, archeology and metaphysical science. Does the fact that they are carved from crystal enable them to store information and interact with human thought waves? There is a lot of evidence to suggest this is so. Astonishing Portals to Man's Past, by David Hatcher Childress and Stephen S. Mehler, 294 pages. 6x9 Paperback. Illustrated. Color Section, Bibliography.Rogue archaeologist and explorer David Hatcher Childress introduces the technology and lore of crystals, and then plunges into a full-on search for the source of the crystal skulls. The history of Mesoamerica, where the skulls were said to originate, is rich with the mystical, magical sorcery of the Olmecs, Zapotecs, Maya and Aztecs. The turbulent times of the Mexican Revolution form the backdrop for the rollicking adventures of Ambrose Bierce, the renowned journalist who went missing in the jungles in 1913, and F.A. Mitchell-Hedges, the notorious adventurer who emerged from the jungles with the most famous of the crystal skulls. Childress brings it all to life with his characteristic panache. Eminent researcher Stephen Mehler shares his extensive knowledge of and experience with crystal skulls. Having been involved in the field since the 1980s, he has personally examined many of the most influential skulls, and has worked with the leaders in crystal skull research, including the inimitable Nick Nocerino, who developed a meticulous methodology for the purpose of examining the skulls, Get the lowdown on the most recent developments in the world of the crystal skulls from one in the know! Includes a 16-page color photo section! 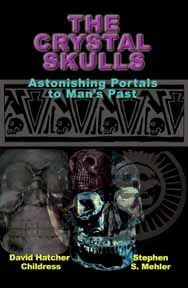 THE CRYSTAL SKULLS: Astonishing Portals to Man's Past, by David Hatcher Childress and Stephen S. Mehler, 294 pages. 6x9 Paperback. Illustrated. Color Section. Bibliography.